It's Friday which means it's time for a new challenge over a Winter Wonderland and our theme is, yes you've guessed it - Penguins. We are sponsored this week by Crafts U Love who are offering the winner a 10 pound voucher. Now I absolutely love penguin stamps and digis and own alot, so I had a really hard time choosing which one to use for my card this week. In the end I decided to go with a digi that I have owned for ages but have never used! Apologies though, this beautiful image is no longer available. It is a Crissy Armstrong illustration and I bought it through Whimsy Stamps. Unfortunately they no longer sell digital stamps. 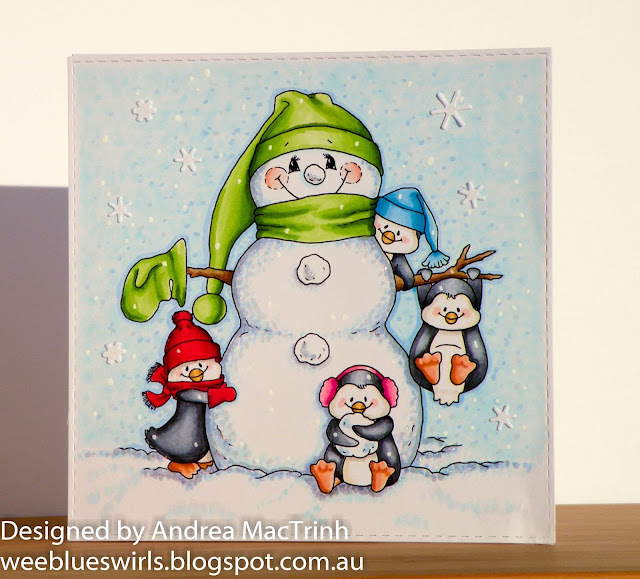 I love this image, not only is there a super cute snowman, there are also four fun penguins :) I decided to keep my card CAS and focus just on the image. I used copics to colour in the entire scene and then adhered a few snowflakes from crystalline border die cut. I also used some Copic Paint for snowfall. What a beautiful image a fab card. WOW! Amazing coloring on that sweet image. You have impressive skills. SO adorable! Love your colouring! 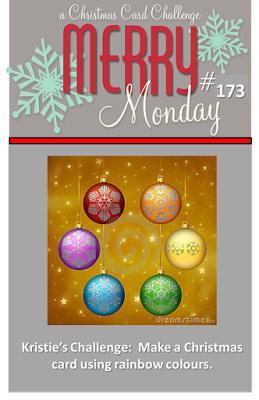 Thanks so much for playing along with us at Merry Monday. Awesome Christmas card. Love every design element. Thanks for sharing at OLCCC and Merry Monday.